A fun, informal and accessible team relay organised by local club 26.2 (each leg 1.5 miles) held in the grounds of the Metropolitan Police Sports Grounds at Imber Court, Molesey - there will be a social afterwards with an opportunity for a pint and BBQ food. The course is generally flat, and takes in a mixture of pathway, grass and gravel lanes. Approximately 10 to 14 race marshals at 8 different points (marked as MP on map) will be in position 10 minutes before the start of the race guiding runners around the course and across all crossing or meeting points. 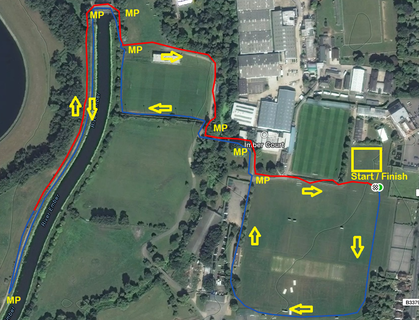 The course map below shows the outward part of the course in blue and in the runners return to the start along the red line shown. To enter, please contact Jon Parry.